Well Im sorry its been a while since thye last post but been a bit busy and not enough time to post but here we are at Ningaloo camped just behind the frontal dunes about 50mtrs from the beach. Preparing for the trip up here from sth of perth some 1200 klms sth of us was expensive as we had to stock up on evrything that we needeed for at least 2 weeks plus other stuff as we are in a pretty remote area closest shopping is 300klm round trip to exmouth. The fishing has been good and the weather allthough a bit windy has been great and we have been swimming most days snorkelling and watching the reef fish as well from the boat and the Kayaks. Hi everyone here we are at Safety Bay South of Perth till the weekend before we leave and head south to Donneybrook to the Bros sis in laws farm for a few days R&R. The weather is perfect 30+ deg everyday. Here we are at Camp 4 w310 after xing the Nullabor what a long drive and all straight rds and BLOODY expensive fuel dearest being $1.99 a litre and having a headwind didn't help either yesterday, today was a bit better.The weather has been different as well raining,yes since we left streaky bay and the country across the nullabor is very green to say the least . 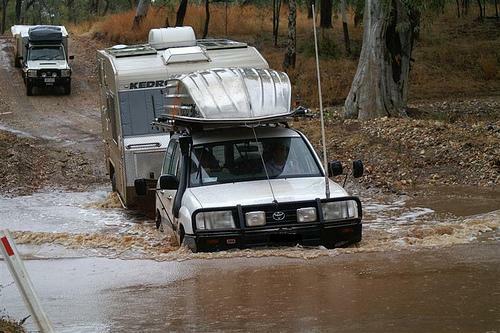 After 2 days at Streaky bay and rain both days glad to be out of their the van park I cant recommend reminded us both of the parks in Broome very unsociable and very clicky IMO. We did meet a couple of Bushtracker owners (locals) Heather and Lloyd whom Heather knocked on our door asking if we were the couple who were looking to buy a Bushtracker van (micks set up) NOT LIKELY was the response but we enjoyed a morning coffee at the local bakery with them then a BBQ tea with them at there beautifull home overlooking the streaky bay then again this morning I saw them on their morning walk around the town and we were invited around to replenish the water tank and morning tea.Lovelier people you would never meet. We are now at Penong and will refuel in the morning as this is the last fuel (cheap) till Norseman 1200klm away and we are not sure of anything from here as we have never travelled these rds before. The weather the last 4 days hasn't been the best and has been raining, the locals would probably say heavy rain enough be a PITA. So till we next get coverage I will update then.